It's important to understand the information that appears on your billing statement in order to make accurate, on-time payments. 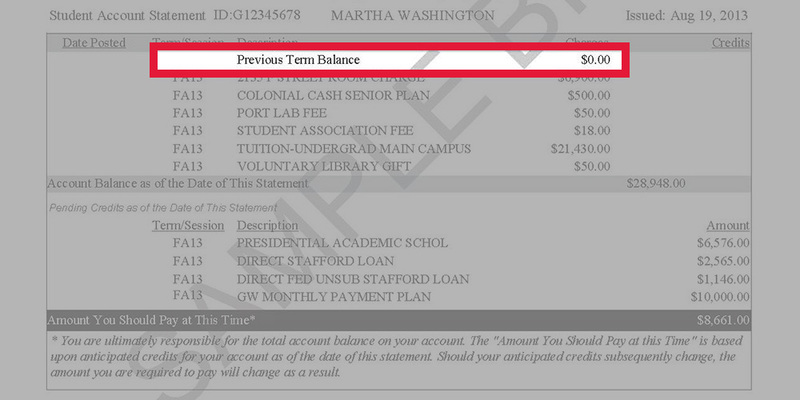 To learn more about your statement of account, please review our sample billing statement. 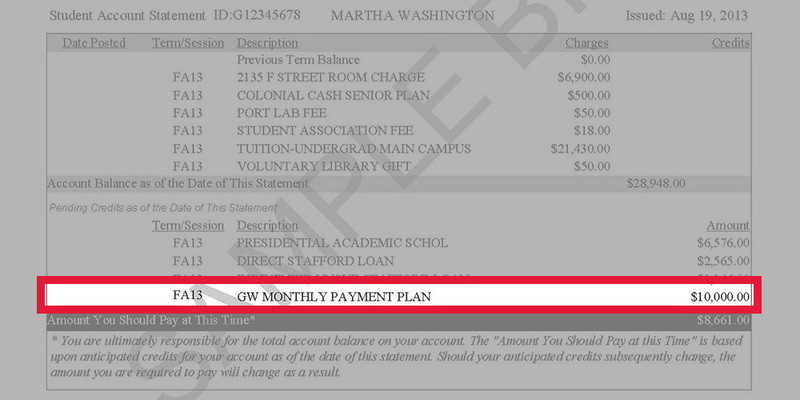 This is a sample of what your GW billing statement will look like. If you choose to mail your payment, detach the top portion of the bill and submit it with your check. Checks should be mailed to this secure, bank accessible lockbox. This Post Office lockbox does not accept overnight deliveries or correspondence. 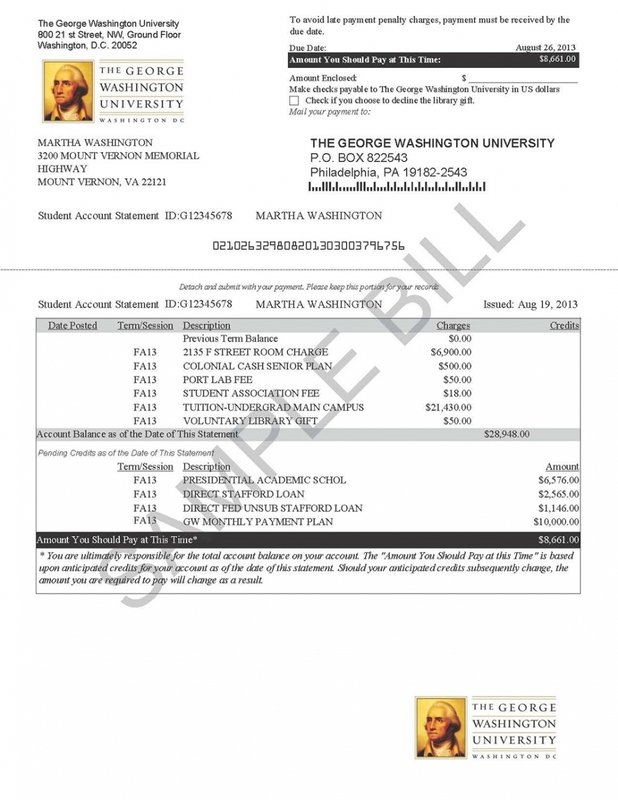 The account holder is the student, whose name and GW ID number will display here. Date the statement was generated. All information shown on the statement is as of this date. For a listing of current charges, please check the Current Activity on the Student Account eBill. Balance or credit from a prior semester. 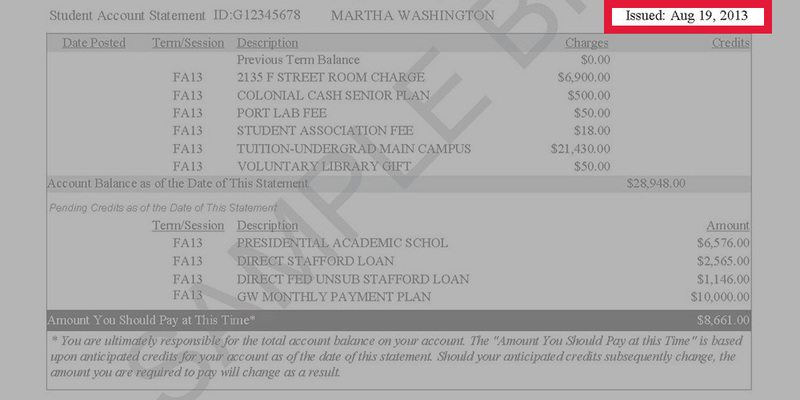 Shows all charges and credits by term, with a short description and the corresponding amount. NOTE: Tuition is not itemized by course. Any anticipated payments that have not yet posted to the student account. Any items listed in this section are still pending, and once posted will show as a credit. 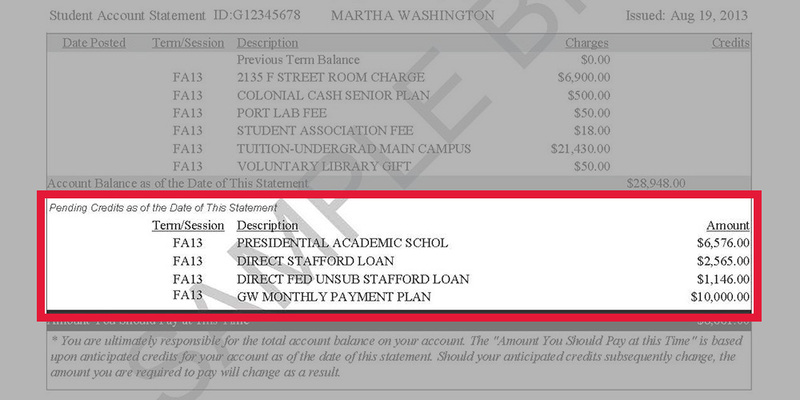 The only pending credits you will see are the GW Monthly Payment Plan, Federal Aid and Institutional Aid, when applicable. If you have signed up for the GW Monthly Payment Plan through ECSI, this is the anticipated amount of your remaining monthly payments for the current term. This amount has not yet paid to the account; it reflects what we are expecting to receive from ECSI. Payments that have already been made and processed will show as a cumulative credit. Balance due after all pending credits are applied. 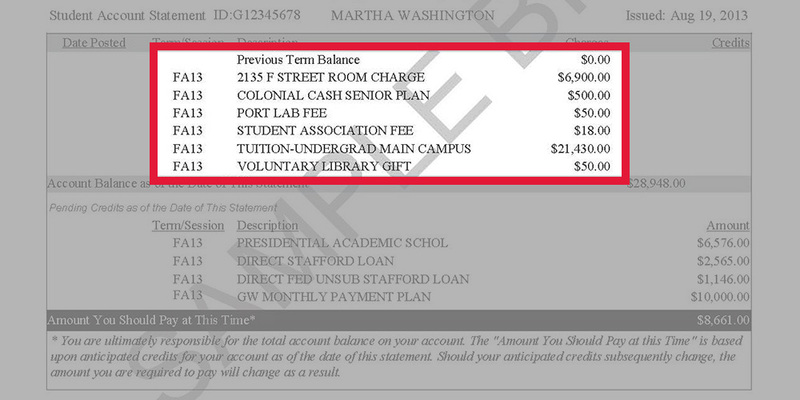 These funds will not post to the student's account prior to the first day of the semester. 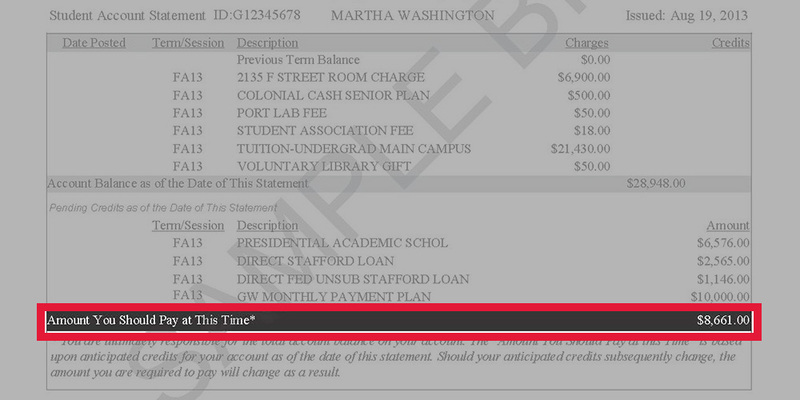 Should any pending credits change, the amount due will change as well. 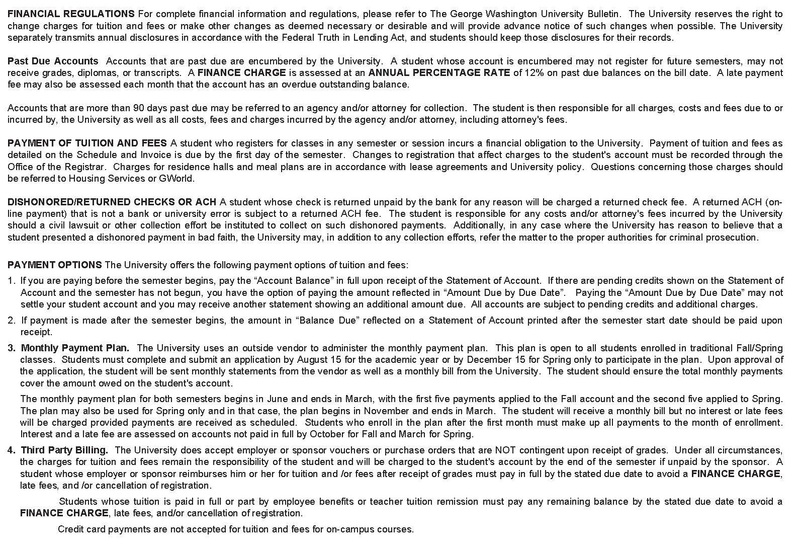 The back of your GW tuition billing statement will include important details about federal and university policies and regulations.